The Curtain Call Color Challenge: Act 23 posting will remain at the top of my blog page through Friday night. 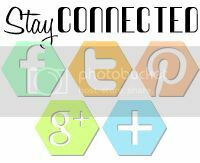 Scroll down to view more recent projects. After hitting you all with a bright & bold color scheme last week, I felt it was time to calm things down a bit. Look at this gorgeous inspiration room with the Sydney Damask wallpaper at Thibaut Design. I love the subtle Pretty in Pink, Whisper White & Kraft with the contrast of Basic Black! 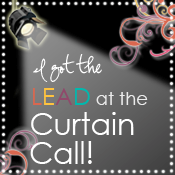 Please note the new deadline will be Friday night: You have until Friday, April 2nd before midnight (CST) to enter your Curtain Call Color Challenge: Act 23 project. 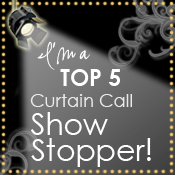 Join us for the Curtain Call Color Challenge: Act 23 and you could be one of the next Show Stoppers! We have two new award up for grabs! Those chosen as "The Lead" and "Top 5" will receive an award to post on their blog(s) and share the exciting news! 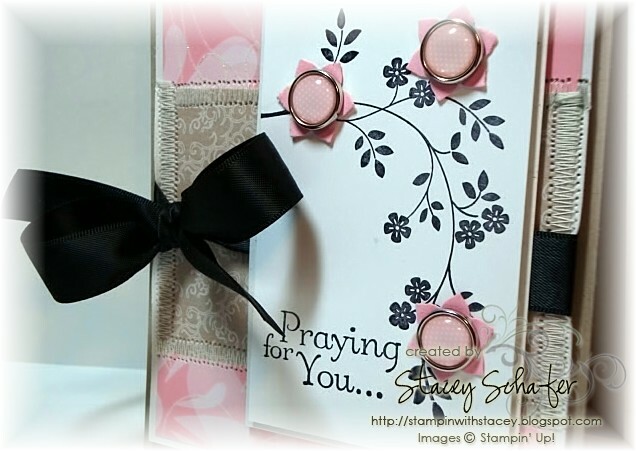 I inked up this lovely image from the Thoughts & Prayers stamp set in Black Stazon and attached three flowers punched from the Boho Flower Punch with the Pretty in Pink Epoxy Brads. The layered designer paper is from the Sending Love & Bella Bleu pack, the perimeter of the kraft print stitched with the sewing machine. The real wow is that yummy Basic Black Satin bow! 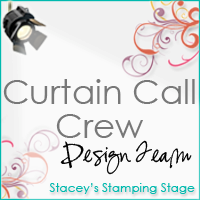 ...then play along with us and post your Curtain Call Color Challenge: Act 23 creation using Mr. Linky back here at Stacey's Stamping Stage. This is so pretty!! I love the stitching that you added to it! Great job with the color challenge this week! Stacey, the colour choice for this week is right up my alley - so very elegant! I love the stitching on your card (in times like this I wish I had more options in my sewing machine...), and the flowers are terrific! This color combination is so beautiful and elegant. I will have fun with this one. Your card is georgeous Stacey. Great colors this week. Great color combo Stacey! Your card is fantastic! I love how you added the epoxy brads to the flowers! Your Card is beautiful and i love this color combination. Another stunner from our fabulous leader!!! Fantastic card Stacey! Just gorgeous, Stacey! Your creations continue to amaze me! This was hardly a challenge, Stacey....I love these colors so much! I think the flowers a top the black stamped image is genius (wink, wink!) Funny how things work out! You know how much I love stitching, so I love this! I instantly fell in love with this colour challenge. So happy I've come across your blog. I always like your colour challenges, I struggled with finding any matching DSP in my stock in the colours but I think it looked better plain. Thanks for the great inspiration. Love the colours and inspiration photo this week!! Just linked my card up! Love this color combo, and your card is beautiful! Thanks for the inspiration! Fabulous color combination! I can't see Mr. Linky, so Here is my card. Really love this soft beautiful colour combo! I loved the sample you have done too! Good Morning Stacey :)!!! Your Color combo was once again fabulous and I had so much fun I had to make two cards :)!!! These colors were just what I needed to work with this week Stacey. Thanks! Oh, what a beautiful card and what an elegant color combination. Love them! Great colours this week! I've just linked my creation. Your card is wonderful. I really liked the color combo. A gorgeous inspiration photo and the colors were so elegant and sophisticated. Thanks for a great challenge! Oooh, this is lovely! Great colors and I love how you put those big pink brads in the flowers! I played!!! Hooray! It has been a busy week and I didn't think I would make it but I did, just under the wire! Thanks for the great colours! am I blind??? 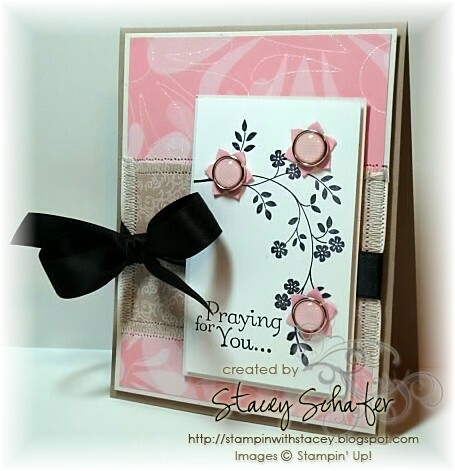 I can't find the box to link up my card that I created with your beautiful colour challenge???? Argh, can't believe I missed the deadline, was sat on my desk all made yesterday afternoon too! Stacey, your card is so pretty. Love the flowers and Brads.